Like most theme parks, Universal Studios' tickets are expensive, and their discounts for kids are small. Ticket prices do not include parking fees which you should add to the budget for your visit. Unfortunately, there is no free parking anywhere nearby. Until the Wizarding World of Harry Potter opened, most people could see the park in one day. Now it may take a day and a half, or even two days during the busiest times. If you're going to visit, find out how to make the most of your visit and use these tested and proven tips to avoid making those rookie mistakes that everyone else does. Types of Universal Studios Tickets. Anyone two years old or younger gets in free. For current ticket prices check Universal Studios website. In the past, you could buy a Universal Studios ticket and use it anytime up its expiration date. You can still do that, but you can also opt for a money-saving ticket that's good only for the date you choose when you buy it. 1-Day General Admission: Good for 1 day of admission (on a specific date), including all rides, shows, and attractions. 1-Day Anytime: If you don't know exactly when you want to go, you can still buy online, but you will pay the same as you would at the gate. With short lines at the ticket booths these days, this option doesn't have a lot of appeal. 2-Day General Admission: Only slightly more expensive than one day and the best option if you are on vacation and want to experience everything. California Resident: If you are a California resident, you may be able to buy one-day or express tickets. They are valid only for the date you purchase them for and are available online only. Universal Express Pass: It's just like the 1-Day Pass except you lose the wait and go right to the front of every line. This pass is priced by age, with children 2 years old or younger getting in free. The cost of the pass varies by season and is less expensive January through March. VIP Experience: The VIP treatment lets you go behind the scenes to visit closed sets on the backlot, and you'll also get escorted priority access to all rides, shows, and attractions. Season Passes: You can often get a season pass for the price of a one-day admission if you go late in the year. Year round, the details vary, with some passes having blackout dates or offering free parking and other benefits. 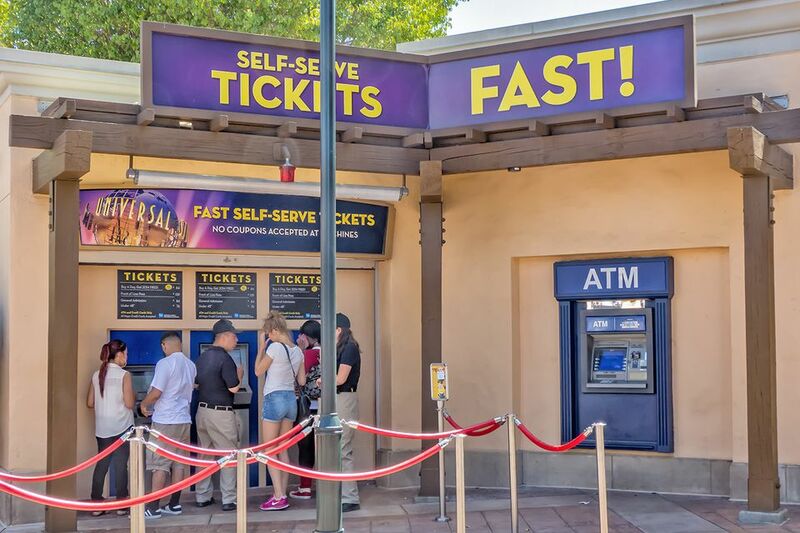 If you go to the ticket booths at Universal Studios, you'll find a different list of categories for tickets, General Admission and Under 48 Inches. At first glance, it looks like anyone who is older than nine and shorter than 48 inches could save money by waiting to buy their tickets at the park, but online discounts for adult tickets make them the least expensive way to go. You'll save money. Online tickets cost less than those bought at the gate. The discount is higher for less-busy days, but it drops when they expect a big crowd. Avoid sellouts. If you plan to go during busy times (school breaks, three-day weekends, summer, Thanksgiving, and Christmas) and can commit to a specific date, you can be sure you'll get in. Early Park Admission to The Wizarding World of Harry Potter™ It's hidden in the fine print on Universal's website, but people who buy their tickets online get into Wizarding World one hour before the Theme Park opens (subject to availability, cancellation, and change). However, almost everyone buys their tickets online, so don't expect that this will keep you out of the crowds. Buying tickets from a mobile device: You can buy your tickets from a mobile device. Universal recommends that you print your tickets, but you can also show them on your mobile device screen at the park entrance. For an easy, no hassle purchase, try downloading the Universal Studios App. That sounds weird, I know. If you pay more, are you really being smarter? The answer is yes. During the busiest times, the wait for the most popular rides at Universal Studios can get quite long, sometimes more than an hour. If you're visiting on vacation and have only a day to enjoy the place, those long waits could make it hard (if not impossible) to fit everything into one day - and who wants to stand in line on vacation? Instead of being frustrated by it all, you can buy an Express Pass, which will give you access to every ride a lot faster. As you'd expect, an Express Pass costs more than the basic general admission, and they can sell out. Expect the longest lines during the summer, spring break, three-day weekends and around the Thanksgiving and Christmas holidays. For those times, you might as well buy an Express Pass in advance. For the rest of the year, use this strategy to manage your costs: Buy regular admission tickets, get inside and then assess whether the wait times are intolerable. If they are, you can upgrade your ticket at a booth near the entrance. You can also get a same-day assessment of the crowd level before you go at isitpacked.com. If you are planning to visit more places than just Universal, look into a 3-day or longer Go Los Angeles Card which can save you money on your total vacation bill. Expedia offers Universal Studios tickets with discounts that look appealing, but beware. The savings they show are based on the price of a ticket purchased at the gate and are only a few dollars less than online prices. They are good for your selected date only and also sometimes sell out. During less-busy times of the year, you may get an extra day free with a one-day ticket. In late Decemer and early January, you may also get an annual pass for the price of a one-day ticket.